Our second day on land in Niue started at a reasonable hour. We headed straight across the island to Lakepa Village. The drive across the middle took in so many different types of vegetation, you thought you were in different countries every 5 minutes. 1 minute you are amongst trees and grass fields, then you are in a dense rain forest and then you switch to tropical bushland. There wasn’t a lot to see in Lakepa Village so we headed down the coast to Liku Village and went out to the lookout. We walked a fair distance as the road is steep and we needed a walk anyway. At the coast line you could see the sea was very rough and the coastline was very different to the west coast. Further down the road we came across the Hikulagi Sculpture Park. The sculptures are made from debris left behind when people left the island, or that had been washed up on the beaches. Some were made entirely from thongs. The main one had pots and pans, microwaves, bicycles, car parts and so much more. They were out to say how wasteful today’s generation is and it certainly did that. Seems like every day we become a more ‘throwaway’ society. We waste so much money and so many resources, things that a lot of people don’t have. In our motto of Reduce, Reuse, Recycle, REDUCE is the first one. We need to continue to reduce the resources we use, especially anything to do with plastic. Even these islanders get it. Togo Chasm is further down the road and is signed as a 45 minute walk. You park the car in almost rainforest vegetation. As you walk along you see all sorts of vegetation and we even saw a few breadfruit trees, however no fruit on them. Then we come across a pandanus forest as you go up and over a ledge. Then you come across a limestone outcrop and as you descend amongst the rocks, the entire coastline opens up to your viewing. 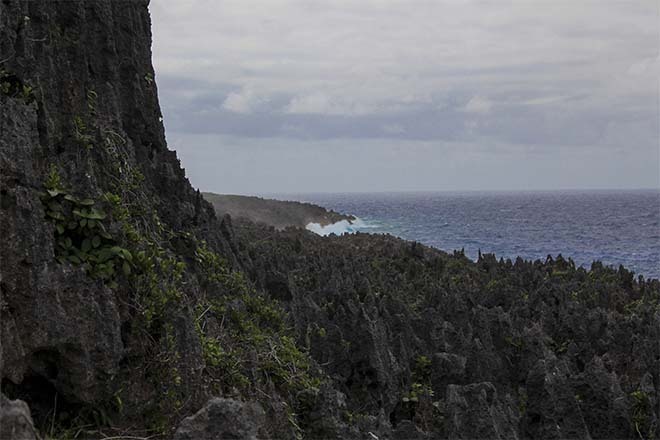 The walk is not 45 minutes if you just walk it, but when you see this coastline, you can’t just walk without stopping and admiring the harshness of the limestone pinnacles as they stick up all over the place. In first world countries, so many people want to create these rocky gardens and here sat thousands upon thousands of limestone pinnacles. If you dropped a yacht onto it, there is no way it would survive. It was so rugged, yet so beautiful. You descend down through a track in the pinnacles and then you come across a ladder that drops you into the chasm. In the chasm is sand and palm trees. At the foot of the ladder are hundreds of little shells on the shore line where the sea comes through the rocks. You climb over a few rocks and at the end is a kind of swamp where algae is growing on top of the water. In amongst the rocks we found a huge coconut crab. They are beautiful crabs with their vibrant colors. Apparently they are very tasty and as you cook them up, you actually use the juices in their tail like a sauce over the crab meat. We didn’t get an opportunity to try it but it certainly sounds interesting. We wandered back to the car thinking it can’t get much better than this. Our next stop was Anapala Chasm on the south east corner and the drive takes you down a hill that you question whether a 2 wheel car will make it back up. A short walk brings you to a narrow chasm and in the bottom is a pool of fresh water. This used to be the water supply for the area. Now you climb down a series of stairs and the rock formations are stunning. We jumped in for a swim and it was cold, there is no other way to put it. 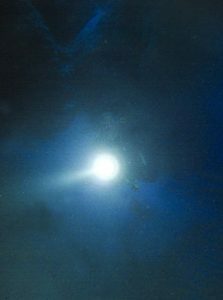 I swam to the other end and my LED Dive torch shinning off the water surface lit up the walls in a magical way. It really was a stunning place. The water was also ultra-clear. Driving around the southern end and there were lots of abandoned houses once again. One curious tradition in Niue is that they bury their families in the front yard, so you have all these gravestones in front of most houses. They are beautifully decorated and well looked after and some have amazing views, however I wonder how you go moving house? Do you take the family with you? 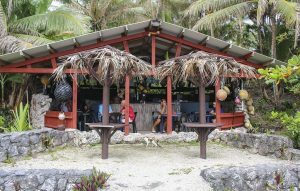 We made our way over to the south-west corner of the island to Avatele Beach and the Washaway café. This café is a tourist attraction in itself. 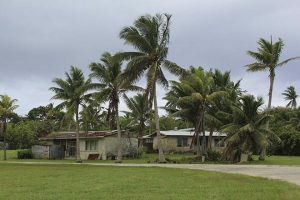 It is a thatched roof hut with a bar in the center and the kitchen towards the back. There is a book on each counter and you write your order in the book for your food and they will cook it up and bring it out to you. The bar is self-service and you write what you have taken in the book. At the end the owner will look at the books and tally up the amount. Very simply and very easy and the burger I had was awesome. The view over the beach is pretty stunning too. On the beach, a sign board tells the story of a local lady who used to paint on the beach. The story goes that she was so good that the ocean creatures used to come in and ask to be painted. One day a whale comes in and asked to be painted and she laughed at him and said he was too fat and ugly to be painted. The whale was offended and swam away. One day when the artist was swimming in the shallows, the same whale returned and ate her. Whilst she was living in the stomach of the whale she knew she was travelling a long way and she eventually forced her way out. She was near land and swam to the beach. She was in Tonga and ended up marrying the local chief. After lunch we made our way back up to the north-west region to finish off the pools and caves we had missed the day prior. We first went to Hio Beach, the longest sand beach in Niue….it is about 50m long at best. As it was low tide you could walk out over the reef. After a quick wade we made our way up to the boat ramp near Namukulu Village. Now this was a very different boat ramp. There was a break in the reef that ran sideways to the outer reef and then a small gap in the reef to get out. You’d want some confidence to launch a boat here as there wasn’t much room for error. Our final stop was Avaiki Cave. This is known as the royal pools as the royals used to swim there. As you descend down through a cave you see the reef and whilst the cave is gorgeous, you don’t see the pool until you pretty much walk out onto the reef. To the north there is another cave with a beautiful pool under it. It was stunning and you could see why the royals swam here. We had a swim and then went and jumped in a few outer pools to see what we could find in the way of corals or creatures. We found a very small red nudibranch and a manta shrimp, along with a few other really cool little creatures that most people wouldn’t even see. We had to look hard but the reef is a magical place when you look closely at it. Manta Shrimps may be small however they are quite dangerous. They actually pack a good punch, so much so you have to be careful that you don’t get your cameras too close, they’ve been known to break lenses. They can also bruise you if you get too close. Not bad for a little creature that is about 5cm long when fully grown. 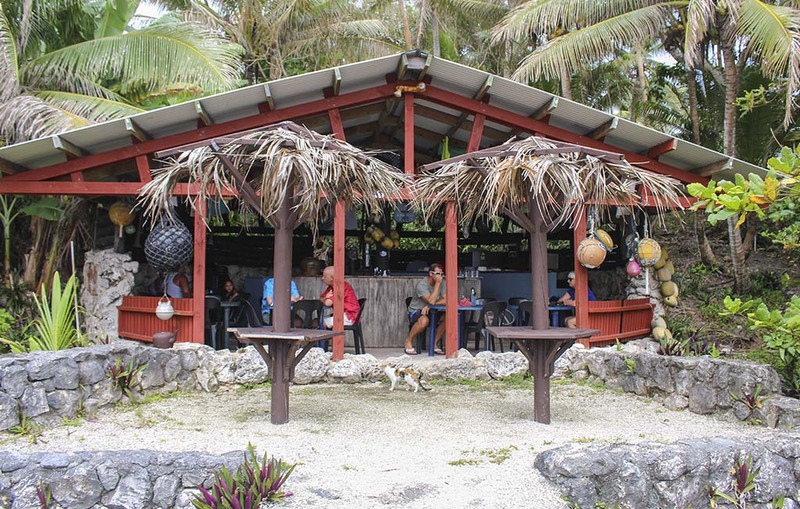 After two full days of exploring the island, we were pretty tired so made our way back to the boat for a relax before we were to have dinner with Julz and Remi from Magical Niue. The following day we would be diving so we needed to rest up a bit. Dinner was awesome, they were so welcoming and the story told to us of the island, that you would come as strangers and leave as friends was ringing true. This really was an awesome place, a real highlight on our trip, and a place so few people even know exists, let alone will visit. 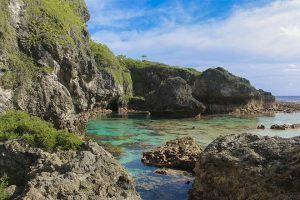 In our next edition we hit the waters of Niue for some diving.